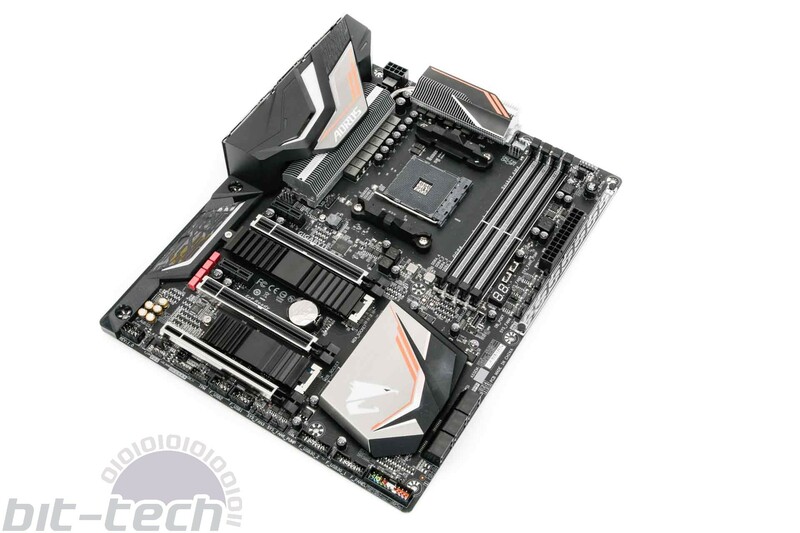 So, AMD's 2nd Gen Ryzen CPUs turned out to be rather good, but to take advantage of all the features on offer, you'll need one of the newer X470 or B450 motherboards, and it's the former that we're looking at today, specifically Gigabyte's X470 Aorus Gaming 7 WiFi. At just over £200, this is firmly in premium motherboard territory, so you'd be right to expect some additional features for the PC enthusiast and overclocker. 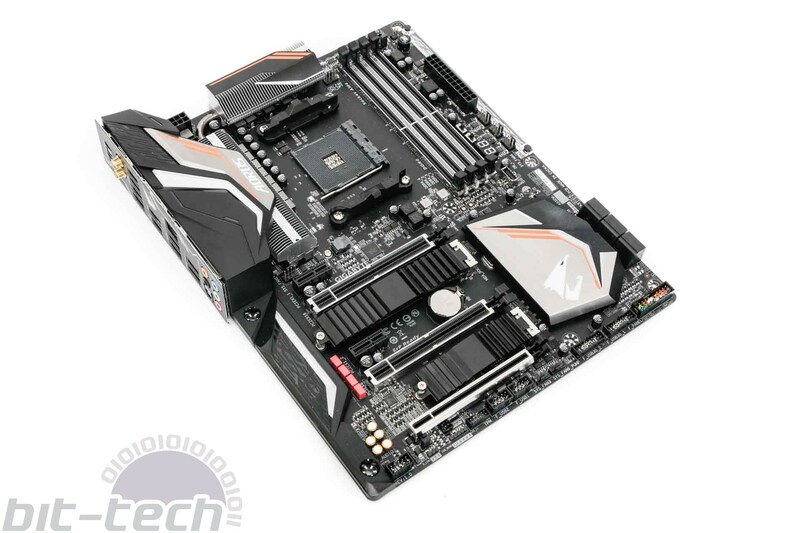 To start with, this is easily one of the best-looking motherboards we've seen in the last 12 months. Amazingly, it looks just as good with its hugely extensive lighting switched off, with several chunky heatpipe-equipped heatsinks sporting an especially dense array of fins. These sit atop a 10+2 digital power phase design and are capped by silver, black, and orange details. 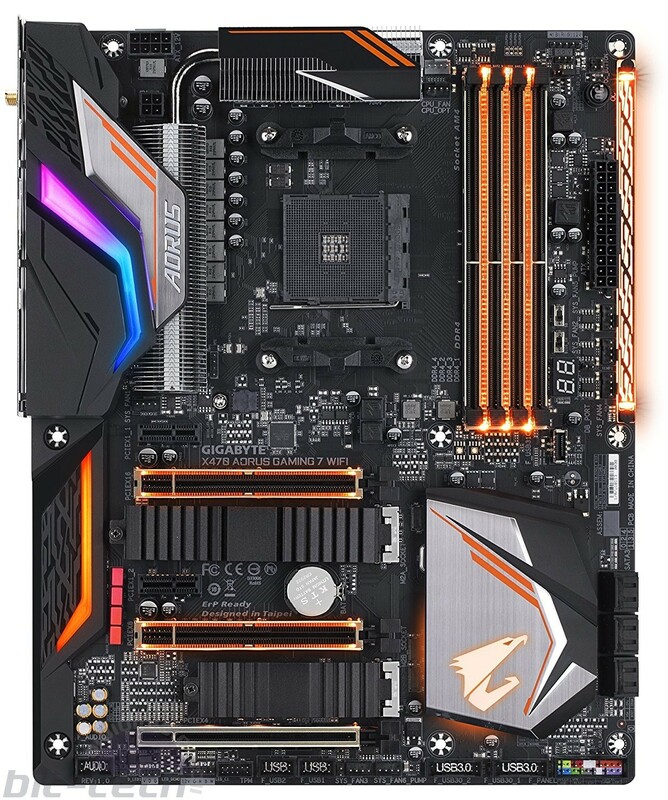 To feed this, you get not one but two CPU power connectors, with an additional four-pin connector added that was absent on all of Gigabyte's X370 efforts, so the X470 Aorus Gaming 7 WiFi clearly means business. The RGB lighting has been taken up another notch, too. You get the same funky PCIe and DIMM slot lighting, a smattering of RGB LED headers, and strip lights on the right of the DIMM slots. We've seen this latter element on other premium Gigabyte boards, but here Gigabyte also includes two diffuse strips of acrylic on the left side of the board - one covering the audio circuitry, the other sporting several RGB LEDs that can be controlled independently to create rainbow effects, increasing the number of effects the board is capable of.The lighting also extends to the PCH heatsink, but while we love the board's colour scheme, the fact it's not entirely colour-neutral thanks to splashes of orange might make it tricky to colour-match effectively to the rest of your system. However, there's so much lighting that those orange splashes can quite easily be drowned out. 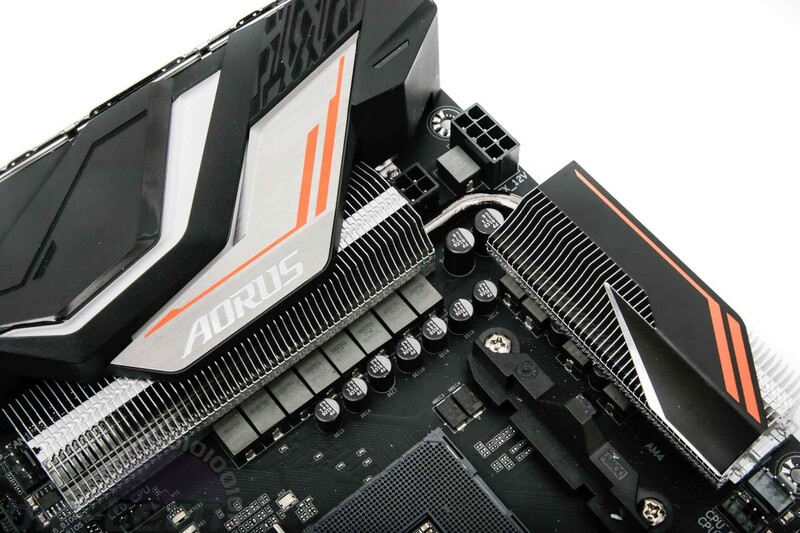 If you're building a PC with an extensive air or water-cooling system, then the X470 Aorus Gaming 7 WiFi has the tools to control it, with eight hybrid fan headers each able to dish out 2A/24W of power, so you can hook up many water-cooling pumps to them too. Near these are switches for the dual-BIOS feature, an LED POST code display, and a USB 3.1 Type-C front panel header too. There are more than 100 aluminium fins in a stacked design that use a direct contact heat pipe, which Gigabyte claims increases heat dissipation up to three times and offers 40 percent better cooling than traditional solid metal heatsinks. 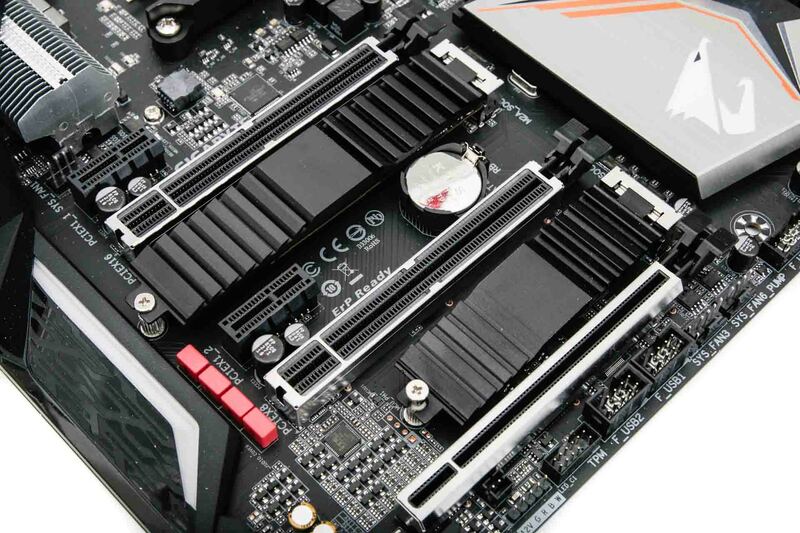 The M.2 ports get their own cooling boost too with a pair of heatsinks, and the top slot supports either PCIe or SATA M.2 SSDs up to 110mm in length while the lower slow only supports up to 80mm-long PCIe SSDs. You also get the standard six SATA 6Gbps ports. The audio circuitry is up to Gigabyte's usual high standards, with Realtek's new ALC1220-VB audio codec plus ESS Sabre DAC, Nichicon gold capacitors, and two USB 3.0 ports dedicated for audio DACs that offer isolated, low-noise power and adjustable voltages. The rear I/O panel is the icing on the cake in terms of aesthetics, as it sports an integrated shield that if nothing else will save your fingers from being mangled. There are ports for the onboard Intel 802.11ac 160MHz Wi-Fi, a total of nine Type-A USB ports plus USB 3.1 Type-C, and the full complement of audio outputs. The only small niggle we had with the board was that the onboard power button is also located on the I/O panel next to a CMOS clear button; for us with the board on a test bench, this wasn't as easy to access as a PCB-mounted button, but it's a handy inclusion nonetheless.